Can Stephen Odey overcome his goal drought? 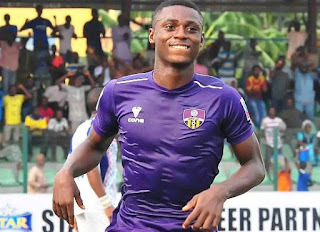 After becoming the first player to score 14 goals in the first round of the season, MFM talisman, Stephen Odey, was expected to continue from where he stopped and raise the bar in the second round to erase the 2014 season record of 23 goals scored by Enyimba’s Mfon Udoh. Truth is Odey needs only nine goals to equal the record and 10 to set a new record of 24 goals. 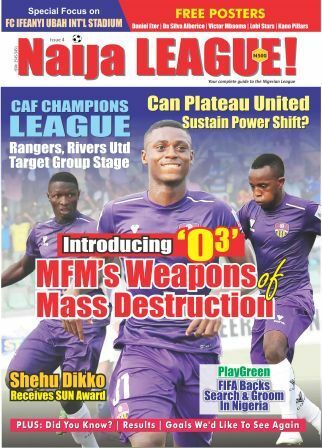 Odey scored his 14th goal in the 3-0 pounding of El-Kanemi Warriors in a top-of-the-table clash. In fact, he scored the first hat-trick of the season against Lobi Stars to underscore his credentials. As a confirmation of his qualities, Odey claimed the influential League Bloggers Award Player of Month in January, and became the first player to win it twice, in March. However, the forward who made his Nigerian debut against Corsica Island is experiencing a drought. Odey has played only two of the four matches played by his team in the second round and failed to score against Akwa United as well as FC Ifeanyi Ubah. The club’s media channel attributed his absence in the road trip at Lobi Stars to injury. So what has happened to the talented youngster? Celebrated Nigerian League legend and SuperSport pundit, Victor Ezeji, has traced the genesis of his challenges to the Danish trip. The youngster was in Denmark, where he had trials with top flight side, FC Midtylland. Although, his club argued that he was invited for a facility tour rather than trials. Odey featured in a match against FC Copenhagen’s reserves. “The problem started with the trip to Denmark,” Ezeji told naijaleaguez.com.ng. “It was a wrong move for him and nothing destroys a player like a controversy about his age,” he added. “Moreover, he will be a marked man during the second round of the season. Defenders now know how to stop him,” he stated. To overcome these challenges, Ezeji believes his club has an important role to play. “Odey needs the support of his club and teammates now to overcome his drought. “And he needs to rediscover himself by going back to see how he performed in the first round. That is he needs to see what he did right and what didn’t go well. Abia Warriors’ Sunday Adetunji and El-Kanemi Warriors’ Samuel Matthias have scored 11 each and are just three goals behind Odey. Alhassan Ibrahim, who scored the third hat-trick this term, is on 10 goals and the experience of Tony Okpotu, who is also on 10 goals, cannot be underestimated. Okpotu scored his second hat-trick this season against MFM to take his tally to 10. There is also Nasarawa United’s top scorer, Adamu Hassan, on 10 goals. Perhaps, it is too early to highlight his drought as the league has 15 match days to go in the second round after four played so far.